It's great value, but we'd suggest that the do-it-all nature of the series falls down in such a large format. Tons of features. Wide range of amp voices. A bit tricky to get used to. No definable target audience. The USB port unlocks editing, recoding and patch sharing via Fender's Fuse software. For an extra £287, you can get Fender's matching V412 speaker cab. Fender is one of the few companies that has managed to bridge the gap between building instruments and amps. We're not just talking about models, though. Most recently, the big F has had successes in the practice amp market with the GDEC3 and Mustang ranges of digital modelling amps. The latest products in the Mustang series see it ditch the agoraphobia and head for the stage, with the Mustang III (100-watt, 1x12-inch combo), Mustang IV (150-watt, 2x12-inch combo) and the most brazen of the lot, the Mustang V 150-watt (2x 75-watt stereo) head and Mustang V 412 4x12-inch cab (£287). "As is often the case with companies who have a historic legacy to draw on, it's Fender's versions of its own models that impress the most." All of the amps come finished in Fender's Carbon Tweed, with traditional Fender control knobs. Each version shares the same 12 amp models and 37 effects - a step up from the Mustang I and II's effects count - as well as an LCD, USB port, aux input, headphone socket and effects loop. The main controls of the amp are centred around the screen: five soft buttons for selecting Amp model, Stomp, Modulation, Delay and Reverb types and a master jog wheel for scrolling and editing parameters. The concept is simple, but in practice you might find it'll take a bit of getting used to. This is where Fender's Fuse software can help. Connect the amp via USB to a computer, and you can view and edit the make-up of each preset in a straightforward layout, rather than dialling through menus. The range of amp sounds on offer is impressive, but as is often the case with companies who have a historic legacy to draw on, it's Fender's versions of its own models that impress the most. Models such as the '57 Champ, '65 Deluxe Reverb and Super-Sonic are put to good use throughout the 100 presets, offering great versions of Fender's classic clean tones. There's plenty of high-gain action here too, from amps including the American '90s, British '80s and Metal 2000, but they're not as immediate as the official Fender jobs. The heavily distorted models sometimes come across as messy at higher volumes through the 4x12 cab. You'll probably spend more time tweaking if you're looking for a great metal sound. Hands-free control is available from the four-button footswitch, but there's also a two-button version that gives you additional control. Unfortunately, the footswitch doesn't offer Tap Tempo - you'll need to upgrade if you don't want to set it by hand. 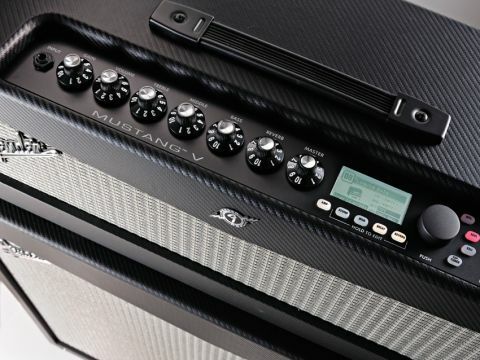 This is a tough amp to call. There's no disputing the fact that it's loaded with features, but it's hard to tell who it's aimed at. If you're using it at home, are you really going to go for the half stack? Conversely, if you're gigging, will features such as the headphone out, aux in and USB connectivity be what you need?